In a large sauce pan heat the butter on medium heat. Add the veggie mixture to the pan and saute until the veggies are tender, about 5-7 minutes. Season with salt and pepper to taste. Whisk in the chicken broth and the Cream of Chicken soup. Let the sauce simmer for 1 minute to thicken. Season with more salt and pepper to taste. Turn off the heat and add the cooked shredded chicken to the mixture, stirring until the filling is well-combined. If the filling is too thick, stir in extra chicken broth. 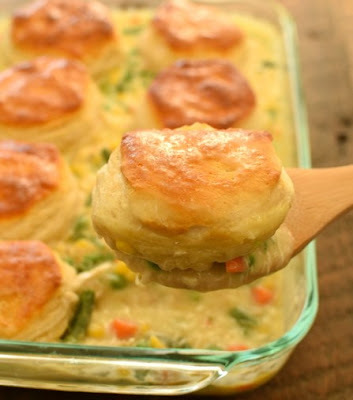 On a parchment lined sheet pan bake the biscuits for half of the time listed on the can for a “pre-bake”. Take them out of the oven. Pour the filling into a buttered 13x9-inch baking dish. Top the filling with the 8 biscuits (partially baked), flip them over top to bottom to unsure even baking on the other side. Bake for an additional 10 minutes, until the biscuits are golden brown and the filling is bubbly. Cool for 5 minutes before serving. Enjoy!